Strip Crown Forms Pediatric prefabricated, transparent strip crowns for primary anterior applications. The strip crowns are ideal for use with chemical or light-cured composites. Strips off easily leaving a smooth surface and thin interproximal walls allow for tight contacts. 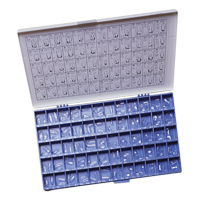 • Crown set is packaged in a unique, stackable tray that provides convenient, easy storage. Transparent Crown Forms C1, LCUSM, 5/Pkg.